Pushing For Better Health Care, One Story At A Time The Virginia Organizing Project is working to mobilize people to lobby for more affordable health care. Health care reform is on President Obama's priority list, but one organizer says it's not just who's in the White House that matters, it's people raising "the level of fuss." 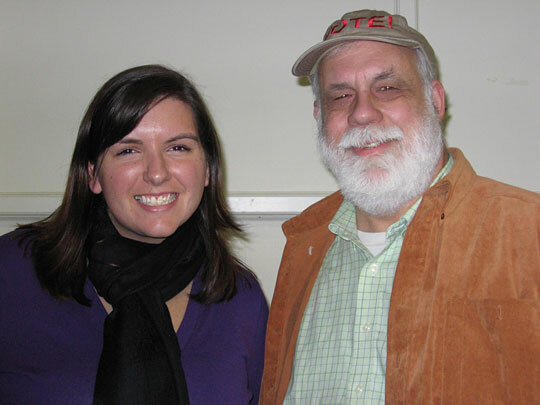 Liz Riggin and Larry Yates work with the Virginia Organizing Project. Community organizers were elated when one of their own, Barack Obama, was elected to the White House. They hoped it would lead to more influence in Washington. Throughout the year, NPR is following some of these community groups to see what they are able to accomplish. Larry Yates has been organizing, in one form or another, since the anti-war protests of the 1960s. With his bushy white beard, he looks a bit like a disheveled Santa Claus. Liz Riggin is a social work major at James Madison University. Working on the presidential campaign of Barack Obama sparked her interest in community organizing. 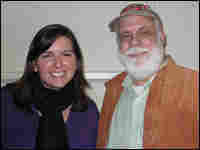 Both of them work for the Virginia Organizing Project, a group with the goal of mobilizing people to lobby for more affordable health care. Riggin is an intern with the group, which has been hosting a series of forums across the state with residents, health care providers and other interest groups. At a recent forum in Harrisonburg, Va., Yates told attendees that lawmakers need to hear directly from their constituents, to counter powerful interest groups in Washington. "Our experience as organizers tells us that the only way [health care reform] is going to happen is not just because the right guy is president, or the right person is in Congress," Yates says to the group. "What will really make the difference is for each one of you, and people like you all over the country, to raise the level of fuss." Riggin passes out paper and envelopes to people, encouraging them to write to their representatives in Congress to tell their stories. Several of them start writing letters on the spot. Yates says community organizing is a gradual process that entails making connections and building networks. He says that if everyone at the forum talks to a few others, the message will spread. He notes that a local TV station also covered the event, reaching thousands more. "Can 30 people change the whole United States? No," Yates says of the forum. "But we did this 10 times across the state, and it's being done all across the country. And this is not the first or last event for hardly anybody here."